Formerly proteges of Limp Bizkit’s Fred Durst, Taproot were feted to be the disciples/successors to Deftones, Queens Of The Stone Age, and, yes, the Bizkit itself. 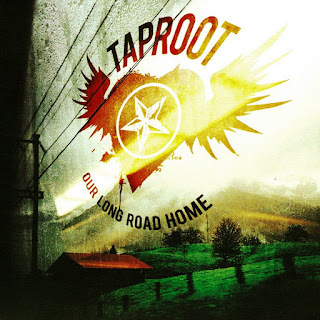 LONG ROAD, Taproot’s first disc in three years, finds them taking a more melodic, radio-friendly approach without abandoning their hard metal style. There’s more attention to vocal harmonies and more of a tighter group sound (as opposed to lots of flashy soloing), and they even feature female vocals (Kristen Von Burthal). Fans of Taproot’s earlier discs may be a little confused, but OUR LONG ROAD HOME finds them heading towards an identity all their own.